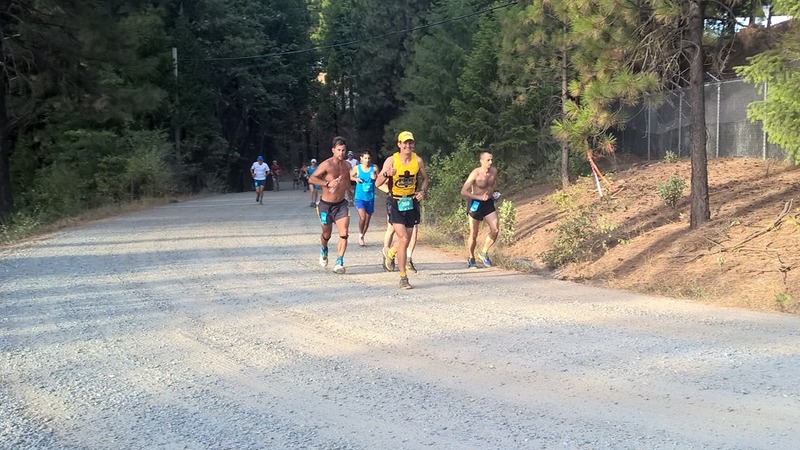 Just like last year, this is a great tune-up race for Ironman Tahoe in 5 weeks. I'm doing the 20mi while Robin is doing the 1/2 marathon. It's great seeing familiar faces like Courtney Cardenas doing great announcing, Lee McKinley ultra-runner and Hawaii Ironman, and Gary Carpenter fellow runner at the Auburn Tuesday Night Track. Our friend Rich Alesci isn't here this year but did awesome last year with a 2:53:33. It's a beautiful morning. Robin & I warm-up running and pray together. We pray for safety, energy, and most of all to be a reflection of Christ and to listen to His leading. I line up with Lee. We are both doing Lake Tahoe this year but he is running the 50k (as usual) today. I ran 3:03:49 last year and hope to break 3 hr this year. I have my last year's course on my Garmin so I can see when I'm ahead or behind pace. Last year I remember praying before-hand for my hamstrings not to hurt bad and my prayers were answered. But I still was careful not to hurt them by going too fast downhill. Go! We're off up the 1/2 mi steep climb. I concentrate on taking shallow steps to conserve energy. 1/4 mi up Robin is taking pictures. It's so great to see her, especially knowing she had to climb up here before her own race in 1 more hour. I'm in 9th as we turn onto the fire road trail at the top. Glad to be on the flat. It feels good. My Garmin isn't showing my comparison from last year but I feel like I'm pushing harder early on. And my hamstrings feel great. In fact, I don't have any injuries or issues. I thank the Lord for that. I'm feeling optimistic about bettering my time today. 3.7mi. At the first aid station I fill my 8oz water flask (1/2 and 1/2 with sports drink). That last 1/2 mi was steep also. My left glute was feeling sore and I prayed and it's feeling better. I'm glad to be past the hard climbs. Now it's just a really dusty mile and then all downhill to the lake. I'm running alongside a guy with a water pack. I encourage him but he seems pretty serious and doesn't respond. Up ahead is another racer, really buff but running smoothly anyway. I'm ahead of Lee. Last year we were side-by-side here and then he and another runner pulled ahead on the downhill because I was caring for my hamstrings. But this year I can run as fast as I want downhill! It's great. Thank you, Lord. This should help buy me some time. I'm still very careful to watch my footing. 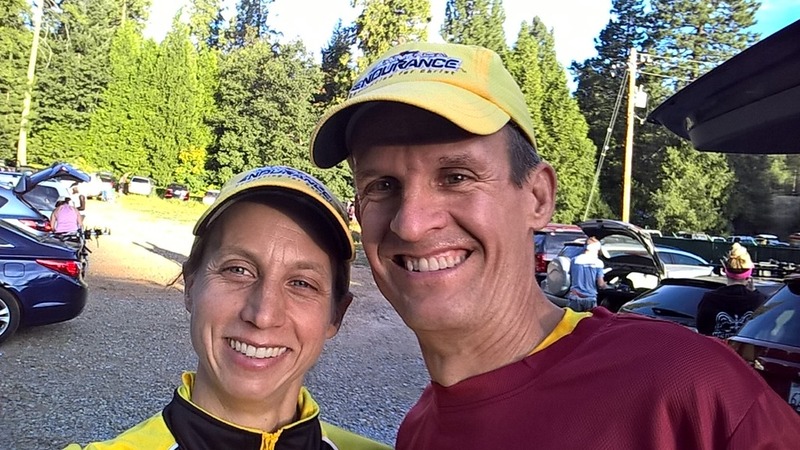 After falling at the Auburn Triathlon I know how suddenly it can happen and the results could be serious for Ironman Tahoe. 6.9mi. I fill up again at the aid station and thank the volunteers. I'm ahead of the guy with the pack but still behind the buff guy. Now for the first technical descent. Crazy roots threaten to grab my feet. Jagged rocks jumping out everywhere. After 1/2mi I'm safely to the bottom. Now it's beautiful groomed trails around the lake. Up & down like a roller coaster. And shaded and cool. I'm working hard but with the cool air my temp is perfect. My left adductor was feeling sore and I prayed and it's doing a little better. My legs are starting to get sore in general but I still try to let legs pound on the descents so I can coast up the inclines. It really helps and I see that I'm slowly gaining ground on a shirt-less guy far ahead. Little by little I gain. Have to be patient in distance running… passes can take a long time to make. After a mile, and within 50 yds of him, I come around a corner and am surprised to see him off the trail waiving me through. I thank him and realize he was probably working harder than I imagined and was glad to let me go ahead. 10mi. At the 1/2 way pt I'm 1:24. 6min ahead of my 3hr goal pace. But the big climb at the end will eat up that advantage. I must keep pushing. I see the guy with the pack far ahead. I'm gaining on him but slowly. 11.2mi. I eat a Hammer Gel before the aid station. I fill up again and head down the steep descent to the dam. 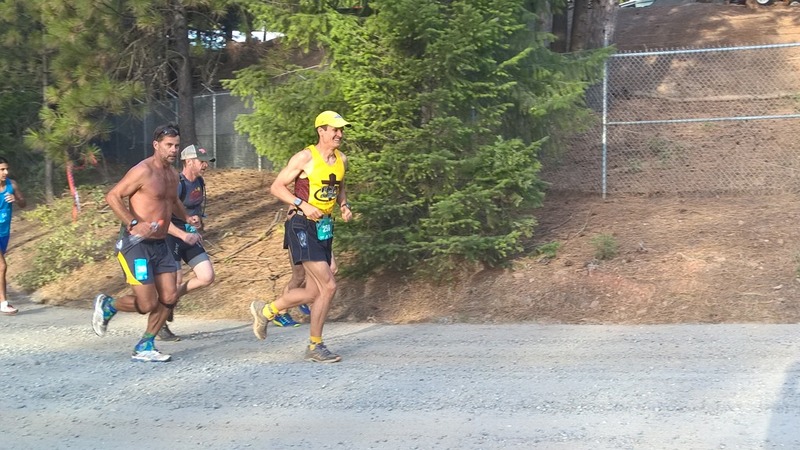 The guy with the pack was a 50k racer and he heads up the hill for another 8mile loop that they do. Now I need another person to chase. Whew, I make it down 1 technical section. Ah! There's a guy ahead. I'm tired but stay alert and time him to get a reading.. he's 1 minute ahead. Another steep technical section, over a stream, and up a hard hill. Wow, he's no where to be seen. I thought I got through that rocky section pretty fast and expected to be close to him. Onto a park road I'm glad for the reprieve but I don't rest. Opening up my stride I pick it up. Glute, adductors, hamstrings, all feel good! A park ranger says, "You're the first one. You must be doing good." I tell him thanks and that the lead guy must have run off course. Wow, I'm in 1st place. Now there's more pressure to keep up the pace because being in this position is a rare privilege. I can't waste it. 13mi. I see some of the 1/2 marathoners running by. Unfortunately don't see Robin. Now we hit the beautiful, but steep trails of the North edge of the lake. They go up up up and then down down down. Each one is more difficult. There are 4 of them but I can't remember and just keep hoping this is the last one before the final long climb to the top. I see the spot where I stopped last year to tie my shoe tighter but my hamstrings wouldn't let me bend down to reach them. Hamstrings are fine this time. But as the climbs get tougher, my inner quad starts threatening to go. It's happened before at Wildflower and I would have to walk. I pray for it and run carefully. 16mi. Finally at the last aid station! I eat a Hammer Gel and drink a cup while the volunteers fill my bottle. I'm in the lead still but realize the other guy could be gaining on me after finding his way back on the course. But this is the part I've been waiting for. The long gradual climb. It went great last year and I'm motivated big time. All the 1/2 marathoners coming down are cheering for me and it's very encouraging. I cheer for them, too. Legs are holding up. It's hard but I'm 1/2 way there. Just 10more min of running. I can do that! 18mi. The top! I see our friend, Mo Bartley, guiding runners at the trail crossing. She's surprised to see me in 1st. I tell her about the lead runner and how I'm trying to break 3 hrs. I've got 20min to get to the finish! Down the switchbacks. Legs and knees already very sore and now having to break my fall down this steep treacherous trail. Don't fall, don't fall! Whew! Onto the fire-road. Easy. Another mile of pushing and then a final steep painful section down to the finish line. I think I'll break 3hrs. As I turn onto the gravel road, I thank the Lord for getting me through all those miles, keeping me from falling, and fixing all the pains in my legs. I look back and don't see anyone. And now I focus on carefully pounding down the road. There's the finish. Thank you, Lord. I cross, breaking 3 hrs, 4 min faster than last year, and Courtney announces that I'm 1st and that my time 2:59 is the same as my bib number, 259. I spend some time in prayer and then slowly walk up the hill to cheer Robin in on her race. This was a great prep for Tahoe and I feel great about it all. Despite being so busy lately, I feel like the Lord keeps blessing me beyond what I deserve. It's really humbling.